diet has been proven as a healthy, effective way of achieving weight loss, as it consists of low-carb, high fat foods that prompt the body to burn fat for energy instead of glucose. The Complete Ketogenic Diet for Beginners is the most simple, easy-to-use guide for beginning the ketogenic diet and starting on the road to success. 75 easy to follow, no-fuss recipes for every meal--including several "fat bombs," a ketogenic diet favorite! Uncomplicated guidance into the fundamentals of the ketogenic diet, advice for living the keto-lifestyle, and a complete two-week meal plan. Easy-prep recipes using five main ingredients or less--this diet requires no costly or specialty foods. A handy "keto-quotient" aligned to each recipe empowers you to make confident decisions about what to eat every day. With The Complete Ketogenic Diet for Beginners you can enjoy your favorite foods, instead of avoiding them. Indulge in Peanut Butter Cup Smoothies, Bacon Artichoke Omelets, Cheesy Mashed Cauliflower, Chicken-Bacon Burgers, Garlic Braised Short Ribs, Raspberry Cheesecake, and so much more. 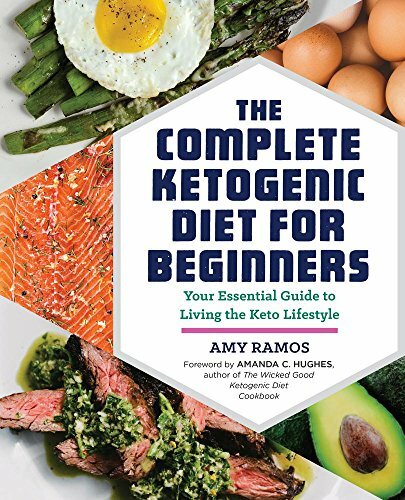 Foreword writer AMANDA C. HUGHES is a ketogenic chef based in New England with nearly a decade of experience in developing and cooking popular low-carb and paleo recipes. Stemming from the success of her ketogenic food adventure blog, WickedStuffed.com, she authored the cookbook The Wicked Good Ketogenic Diet . Her advice and recipes have been described as "life-saving," "hilarious," "delicious," and "nonsense free" by the hundreds of thousands of keto-loving home chefs who loyally follow her. Binding: Paperback Publisher: Callisto Media Inc. Number of pages: 158 Dimensions: 7.50" wide x 9.25" long x 0.50" tall Weight: 1.122 lbs.